Our Progress • Photos and VideosFlash Back to November! 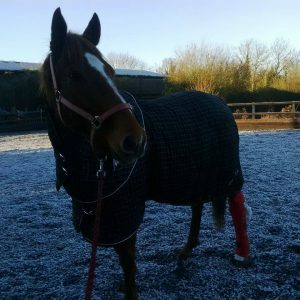 In November of last year, Scottie managed to give himself a very nasty cut on his hock, putting him on three weeks box rest. The vet originally thought he might have damaged a ligament, but thankfully, after a week it was decided it was just a case of where the cut was. Scottie was allowed two 10 minute walks a day for the first week. And after this, he was allowed to be ridden as long as he stayed in walk, as too much movement in the joint would cause the wound to reopen. He was a complete angel for these three weeks and I recently found a video of him being turned out for the first time afterwards! So in true flash back style, enjoy Scottie’s antics!